What's not to love about spring -- the weather, the colorful blooms, and the promise of a fresh start? The sky seems bluer, the air fresher, and the fashion more colorful, whimsical, and romantic. There are a lot of trends that I am loving this spring. I have already shared my gingham obsession and have recently added this adorable gingham bucket bag to my collection. But as much as I secretly want to, I can't wear all gingham all the time. 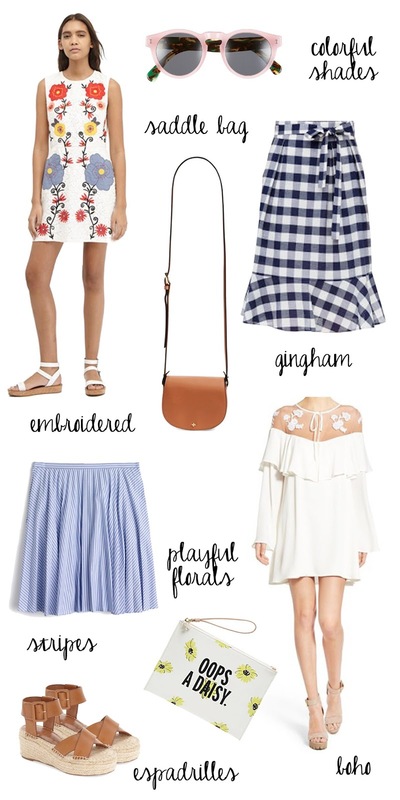 In addition to gingham, I will also be adding some boho touches (think bell sleeves, airy mini-dresses, and saddle bags), espadrilles (I especially love Soludos), round colorful shades, anything embroidered, and playful florals to my wardrobe for spring and summer.